GHF Blog » Events » 8-21-2017 Solar Eclilpse is coming. Are you ready? « Spring Art Show: iPad Art! On August 21st, the entire United States will be able to see a partial solar eclipse. In order to see the total eclipse, you must be inside the Path of Totality. Are you ready? Our safe solar glasses are exclusively manufactured with 2 mil scratch resistant black polymer lenses that filter out 100% of the harmful ultra violet and infrared rays. Scientifically tested and certified to meet the Standard for ISO 12312-2:2015. *standards for direct sun viewing safety. 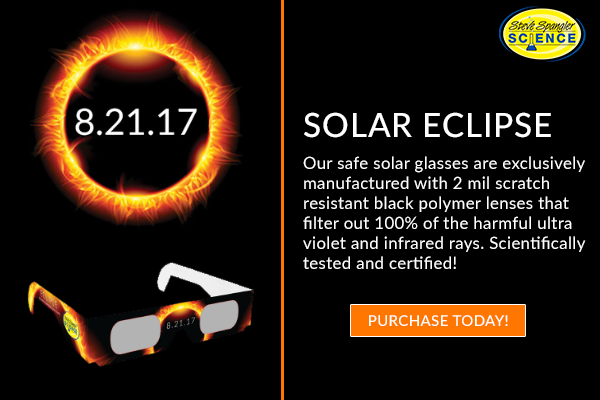 Our glasses allow you to view the total solar eclipse with absolute confidence in your eye safety.